A 53 percent cut in energy use and a significant improvement in the uptime of a hot water pumping systems is the result of installing ABB drives at hotel in Warrington. When the 200-room Daresbury Park Hotel & Spa was acquired by the Britannia Hotel Group in 2015, it soon became apparent that the existing pumping arrangement was in need of an overhaul. The system supplies all the hot water used throughout the hotel including guest rooms, public areas and the spa. The hotel turned to PressBoost, which installs and maintains the pump systems in all Britannia Hotels locations, to provide that solution. Examination of the system revealed three large pumps operating in a duty-standby-standby configuration. Although the pumps were large enough to provide more than enough hot water to meet the needs of its hotel and its guests, the lead pump was suffering from excessive wear, causing it, on occasion, to break down entirely. ”Duty-standby-standby is a bad arrangement, as it means that most of the time pump number one was doing all the work, whilst pumps two and three were mostly idle,” explains Antony Chesters, senior engineer at PressBoost. PressBoost also discovered that while the motor driving the lead pump had been fitted with a variable-speed drive (VSD), it was no longer working. This meant that the pump ran at full speed regardless of demand, putting further strain on the motor. It also meant the VSD was not delivering the energy savings it was capable of providing. PressBoost installed a 7.5 kW ABB drive on each of the three pumps. The drives adjust the speed of the pumps depending on the level of demand. When less hot water is required, the flow of energy from the motor to the pump is reduced. This has enabled the hotel to cut the energy it uses to supply hot water by 53 percent. The system was also reconfigured to work on a duty-assist-standby arrangement to reduce wear on the lead pump. “Should demand exceed pump one’s capacity, the second pump switches on automatically to assist the lead pump. However, regardless of demand, the pumps switch over every 24 hours in order to spread demand and reduce wear on the lead pump,” explains Chesters. The VSDs keep water pressure constant at 3.5 bar, which also helps to reduce wear on other parts of the hot water system. “Before the drives were installed, water pressure fluctuated between 3 and 6 bar, causing water to ‘hammer’ in the pipes. This put additional stress on the pipework, bearings and seals, which in turn contributed to the reliability issues the hotel was experiencing,” explains Chesters. The ABB drives were installed as part of a control panel and are programmed via a PLC. In the unlikely event the PLC fails, a fail-safe programme switches the pump system to single pump, fixed speed operation until the PLC can be repaired, thereby ensuring no loss of supply. Since the system was installed the hotel and its guests have enjoyed an uninterrupted supply of hot water. 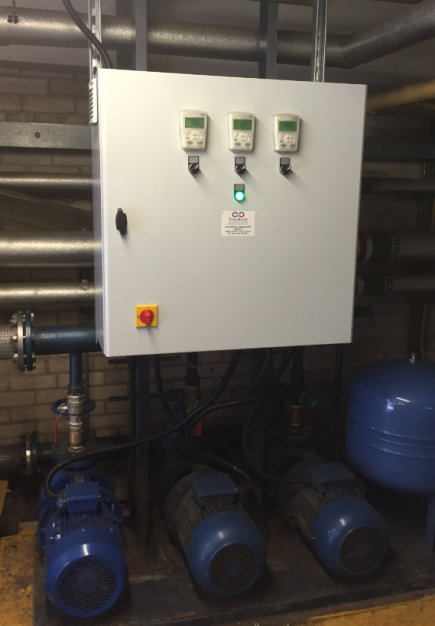 As a result PressBoost has been asked to supply the same solution for Daresbury Park Hotel’s cold water system.